It is fair to say that Marvel delivered a masterpiece in this climactic set piece which successfully culminates several years worth of: character storylines, movies and franchises, across the Marvel Cinematic Universe (MCU). Once again, I couldn’t help but review the film after the sound track, since the two are so extricably intertwined. In fact, you can pretty much tell what the film is about from the title, (plus a little backstory from hundreds of MCU commentary across the Internet), but perhaps the best indicator is when the sound track pretty much plays out the film in sound form. Right from the outset, it was clear the apocalyptic threat posed by arch villain, Thanos, (a Titan and universal scale killer), would not be without dire consequence for our Marvel heroes. Ok, so let’s get this out of the way, (cue major spoiler alert); Thanos wins, and Avengers: Infinity War ends with the demise of pretty much half the sentient beings in the universe, including some key Marvel characters. The latter are linked in various ways with the six infinity stones which Thanos used to carry out his mission. As a result, the film basically chronicles the acquisition of each stone through one painful encounter after another. The great thing about this Infinity Wars is that it ties together the major characters and groups that comprise a great deal of the Marvel Cinematic Universe. They range from stand alone character properties such as: Iron Man, Captain America, Spiderman, Black Panther, Dr. Strange, Thor and Hulk, to team-ups such as Guardians of the Galaxy and The Avengers. However, and for various reasons, certain significant characters and teams were omitted, including: Deadpool, Ant Man, Hawk Eye, The Defenders, X-Men, or The Fantastic 4, which did not in any way detract from the movie as there was enough characters – some would say way too much – to do them all justice in the story. In fact, I won’t even dare to go into each encounter as that would be futile – just go see the film, again. In Infinity War, Marvel effectively brings an end to another chapter in its quest for continued world dominance, by expiring some older properties in order to cultivate newer, fresher generation of heroes, much like Thanos does with half the universe. The film did contain some surprises such as the much anticipated liquidation of key Avengers such as Iron Man, Hulk and / or Captain America which did not happen. Instead newer entrants such as Dr. Strange, Scarlet Witch, Spiderman and the Black Panther get blatted, which makes it likely that the second instalment will rewrite some of the events in the first. Only 2019 will tell. 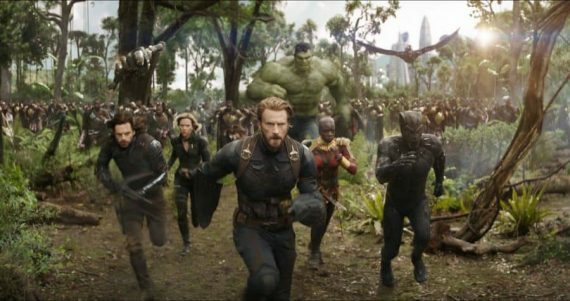 Finally, I have to give kudos to Marvel’s Kevin Feige and Disney for keeping the MCU alive and vibrant with promise, not least because of their recent billion dollar releases in Black Panther and Avengers: Infinity Wars. On behalf of Marvel fans around the world, I say long may it continue!